On Tuesday night, I went to The President’s Reception at UW, an event that is held as a thank you to the university’s donors. 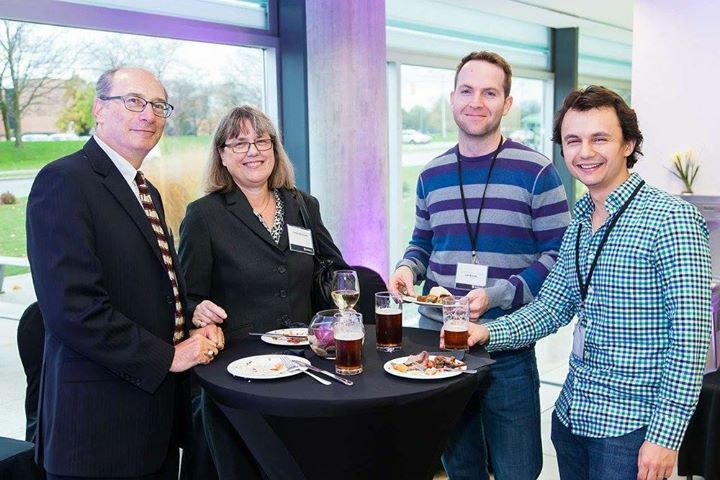 Normally, this isn’t my type of event – I don’t like networking or dressing up on weeknights – but this year I made an exception after some cajoling from the Development Office. Not one to go it alone, I brought my friend Nino, who’s also an alumnus of the university…although he stuck around much longer than I did, as he earned his PhD there. It turned out to be a pretty fun evening, and I’m glad I went. As it turns out, we were the youngest alumni there by … let’s just say a considerable margin … and also the only ones in jeans. Look, “business casual” means something different to our generation than it does to the rest of the crowd. My shoes and socks were the business part, and the rest was casual. But they were 7 jeans and a Penguin knit sweater, and that has to count for something. Also, about five minutes into the night Nino exchanged his coat check ticket for a beer. A minute later, upon inquiry, we found out that we actually were entitled to as many free drinks as we wanted, but the bar personnel had mistaken Nino for a student volunteer. Note to self: when running events, don’t use identical tickets for coat checks and drinks. Anyway, moving on…we grabbed some snacks (which were quite tasty – a tip of the cap to UW catering) and took off to a corner (which happened to be the kitchen exit, so we got firsties on all the hors d’oeuvres), and as chance would have it we ended up talking to two folks, Doug and Donna, who actually have interests in subjects closely related to Nino’s profession (blah blah organic LED television displays blah). Nino and Doug arranged to meet up at Nino’s lab for some fun OLED talks. Yay, OLEDs! 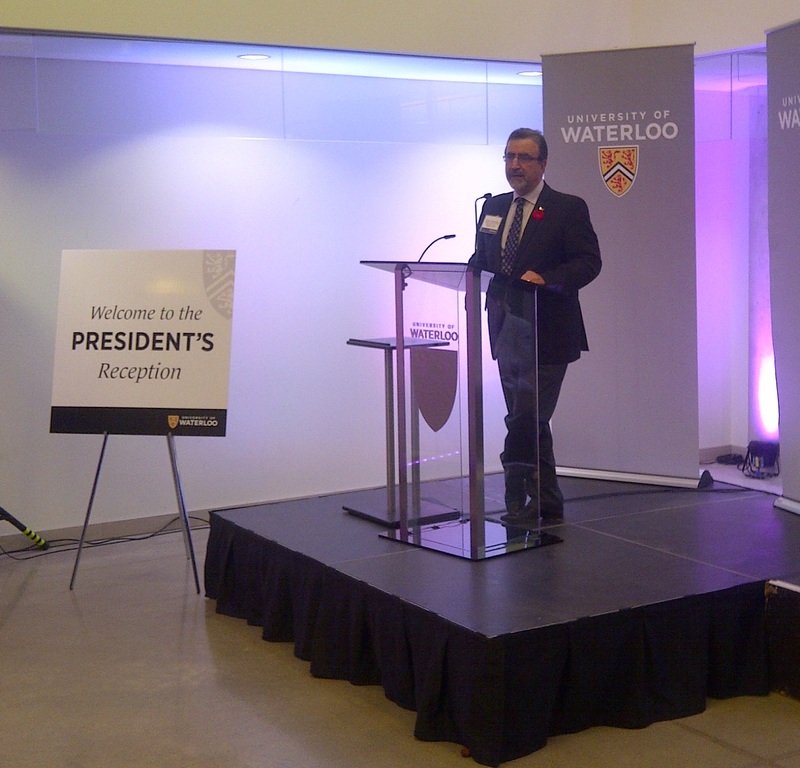 Our conversation was interrupted by UW’s President, Dr. Feridun Hamdullahpur, as he gave his address. I’d never heard him speak before (the President when I was at UW was His pre-Excellency the pre-Right pre-Honourable David Johnston). Dr. Hamdullahpur is quite an engaging speaker, with a very relaxed delivery, the right amount of joking, and confident body language (sorry, I observe this sort of thing). He spoke of Presidential tings, like strategic plans, vision, and producing the innovators of tomorrow. Next up, we heard from three students, who each shared his or her path to UW and explained how donor funds were helping him or her achieve academic and difference-making dreams. The first speaker was a first-year student who came to UW from PEI, to study Physics and Astronomy. She had far more zest for the school than I did at that stage. The kids these days. Second, we had an Optometry student talk about how rewarding it is to help people see…sometimes for the first time. He inadvertently made me feel like I do nothing to help children who can’t see. Third, we heard from a PhD student who, thanks to funding from donors, was able to spend a year in the Kingdom of Bhutan to study the impact of eco-tourism on the fragile local ecosystems. I must say, it was nice to hear from actual students – and they were all talented speakers – and it had what I suppose is the intended effect in making me feel more connected to the school. 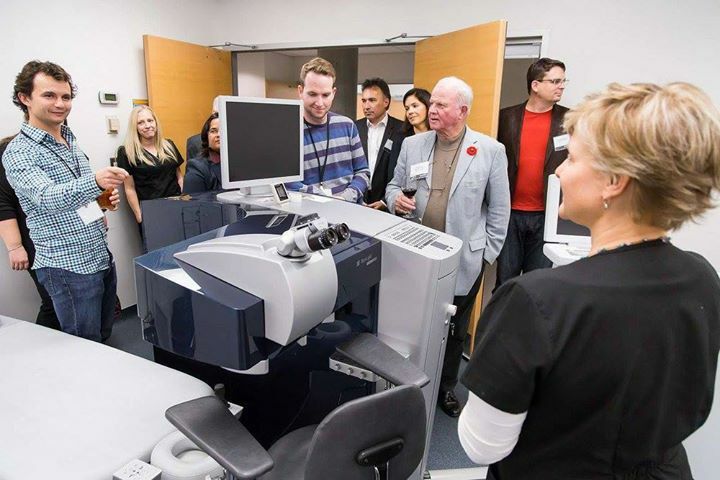 After some more mingling, and a few interesting chats with random folks about things ranging from marketing to the appropriate role of Professional Engineers in academia, Nino and I joined a group for a tour of the new/expanded Optometry facility. I’d only been in this building twice before, and that was ten years ago. The trick to tell the new from the old is: if it’s open, bright, and post-industrial, then it’s new; if it’s grey and dark, then it’d old. We got shown around the clinic, the library, the study areas, etc., and throughout the tour we saw students just going about their studious activities. After the tour, we hung out for a little bit more and had a few more slightly peculiar conversations with random volunteer folk (I appreciate their volunteering…as I’m sure they’re busy), and then headed out. Apparently for an optical clinic person it’s easy to tell the difference between an experienced LASIK operator and a newbie; so if I ever get that procedure, I’m goin’ for the experienced docs. My generation is really dropping the ball on paying it forward. C’mon people, help the kids of today / leaders of tomorrow a little. Getting a tour of the Optometry building; this is the LASIK room. Action shot of Nino! ‹ What makes an excellent performer?